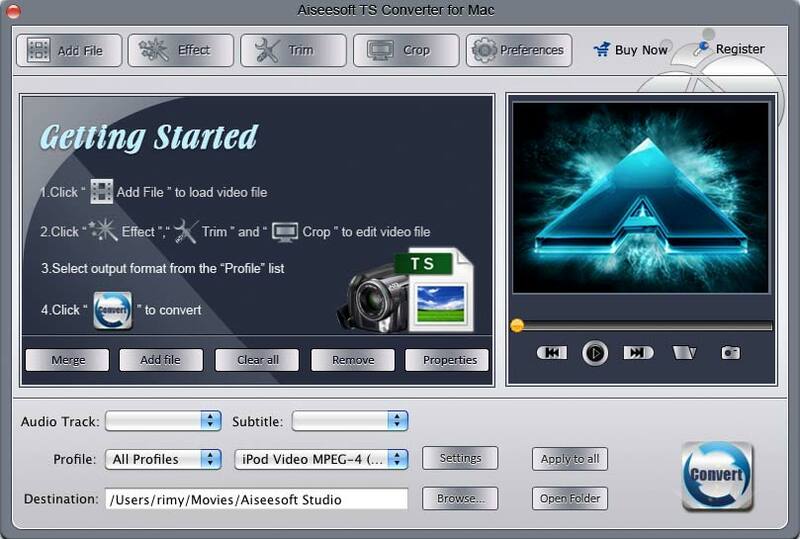 Aiseesoft TS Converter for Mac is aimed at converting TS to AVI, converting TS to MP4, MPEG, MOV, WMV, FLV, etc, or converting TS to iPod, iPhone, Apple TV, PSP, and others. Adding files like MTS, M2TS, TOD, MOD, MP4, 3GP, WMV, AVI, and HD video to your devices, or converting video to TS file in great quality are also possible.Aiseesoft TS Converter for Mac assists you to optimize your video/audio effect, like TS video trim, crop, merge. Convert TS to AVI, convert TS to MP4, MPEG, MOV, WMV, FLV, etc. Aiseesoft TS Converter for Mac also can assist you to optimize your video/audio effect, like TS video trim, crop, merge, and set TS video settings, check the deinterlacing, snapshot picture, and others. This Aiseesoft TS Converter for Mac supports various outputting formats; all this could be completed at a time. With Aiseesoft TS Converter for Mac, you can adjust output video Brightness, Contrast, Saturation and Volume. Checking Deinterlacing is to convert interlaced video to the progressive one to avoid mosaic. Attach pictures, texts or images to your video are possible. Qweas is providing links to Aiseesoft TS Converter for Mac 3.2.32 as a courtesy, and makes no representations regarding Aiseesoft TS Converter for Mac or any other applications or any information related thereto. Any questions, complaints or claims regarding this application Aiseesoft TS Converter for Mac 3.2.32 must be directed to the appropriate software vendor. You may click the publisher link of Aiseesoft TS Converter for Mac on the top of this page to get more details about the vendor.